Rudolf Steiner's beautiful meditative verses for the yearly cycle have been used by countless people over the years. Their purpose is to awaken a feeling of unity with nature, and at the same time to stimulate a discovery of self. In listening to the changing language of the year and awakening a profound sympathy for it, we can in turn discover our own individual nature. Steiner's original and unique meditations facilitate this process, leading to a healthy feeling of being at one with the natural world. 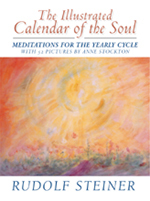 This edition features Anne Stockton's 52 celebrated and evocative paintings, which are a wonderful complement to Steiner's text. Steiner's words are newly translated for this edition by John Thomson. RUDOLF STEINER (1861-1925) called his spiritual philosophy 'anthroposophy', meaning 'wisdom of the human being'. As a highly developed seer, he based his work on direct knowledge and perception of spiritual dimensions. He initiated a modern and universal 'science of spirit', accessible to anyone willing to exercise clear and unprejudiced thinking. From his spiritual investigations Steiner provided suggestions for the renewal of many activities, including education (both general and special), agriculture, medicine, economics, architecture, science, philosophy, religion and the arts. Today there are thousands of schools, clinics, farms and other organizations involved in practical work based on his principles. His many published works feature his research into the spiritual nature of the human being, the evolution of the world and humanity, and methods of personal development.Steiner wrote some 30 books and delivered over 6000 lectures across Europe. In 1924 he founded the General Anthroposophical Society, which today has branches throughout the world.